Mounir Fatmi, Crossing the Line 1, 2015. Pigment print on Fine Art paper, 68.5 x 105 cm. Courtesy Lawrie Shabibi and the artist. Lawrie Shabibi is pleased to present Inside the Fire Circle Mounir Fatmi’s first solo exhibition in Dubai. The exhibition expands on the artist’s interest in the circle, its form and symbolic meaning throughout history. In particular, Fatmi examines the life of John Howard Griffin (1920–80), an American activist from Texas, who wrote about racial equality and was known for his fight against racial discrimination. These two seemingly opposing themes connect through Fatmi’s interest in the idea of repetition, erasure, movement, and the tendency of history to repeat itself. At the center of the exhibition is Inside the Fire Circle a new sculptural installation from which the exhibition takes its name. Other works in the show referencing the circle include wall sculptures produced from white coaxial cables that have been intricately manipulated into repeating circles, creating a sense of addition and subtraction—or infinity. A series of ten photographs titled As A Black Man consists of a portrait of Griffin from the John Howard Griffin Archive with a focus on an experiment in the late 1950s. Here Griffin underwent treatments to turn his skin black so as to pass as a black man and journey through the Deep South to experience segregation. 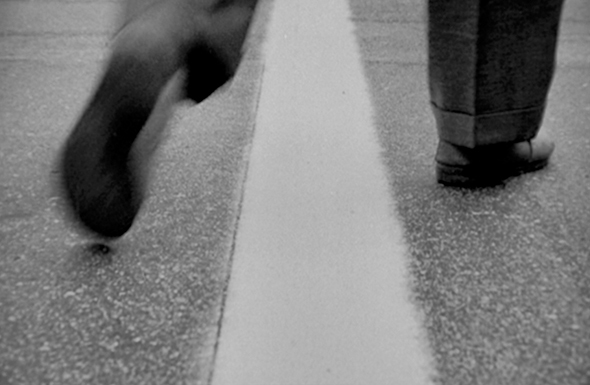 In another set of photographs entitled Crossing the Line, the images depict the lower part of a man’s legs as he steps over a white line on a street, this brief movement considers the notion of crossing over into something else: from white to black, light to dark, privilege to outcast. In another image Fatmi presents a still from the only existing archive of an interview Griffin had with legendary American newscaster, Mike Wallace. Also on view will be a set of three photographs entitled Calligraphy of Fire, and a film, History is not Mine, which explore Fatmi’s interest in language, knowledge and its destruction. Mounir Fatmi (b. Tangier, Morocco, 1970) lives and works between Paris and Tangier. Select institutional exhibitions include Mamco, Geneva; Migros Museum für Gegenwarskunst, Zürich; Picasso Museum, war and peace, Vallauris; FRAC Alsace, Sélestat; Contemporary Art Center Le Parvis; Fondazione Collegio San Caro, Modena; AK Bank Foundation, Istanbul; Museum Kunst Palast, Duesseldorf and MMP+, Marrakesh. His work is in several collections including Art Gallery of Western Australia, Perth; Queensland Art Gallery of Australia, Brisbane; AGO, Art Gallery of Ontario, Toronto; Fondation Louis Vuitton pour la création, Paris; Fonds National d’Art Contemporain, Paris; Fonds Municipal d’Art Contemporain, Paris; Cité nationale de l’histoire de l’immigration, Paris; Bibliothèque Municipale de Lyon; Museum Kunstpalast, Düsseldorf; Fondazione Cassa di risparmio di Modena, Modena; National Museum of Mali, Bamako; MMP+, The Marrakech Museum for Photography and Visual Arts, Marrakech; Museum of the ONA Foundation, Casablanca; MOCAK, Museum of Contemporary Art, Krakow; Mathaf, Arab Museum of Modern Art, Doha; Stedelijk Museum, Amsterdam; Rijksakademie Collection, Amsterdam; De Nederlandsche Bank N.V., Amsterdam; Koč Foundation, Istanbul; The Brooklyn Museum, New York and the Hessel Foundation for the Bard Museum, New York. Fatmi is the recipient of the Cairo Biennial Prize, 2010, the Uriöt prize, Amsterdam, the Grand Prize Leopold Sedar Senghor of the 7th Dakar Biennial, 2006. He was shortlisted for the Jameel Prize of the Victoria & Albert Museum, London in 2013. Lawrie Shabibi is a contemporary art gallery housed in Dubai’s Alserkal Avenue. The gallery supports the long-term development of the careers of international contemporary artists with a focus on those from the Middle East and North Africa.